Back in Betties day it was a sin to waste anything. So one of the things I'm going to try really hard at this year is to throw out less food. According to Food Standards Australia tomatoes and bananas are the most thrown out food item. We rarely throw out bananas - any that do escape the 4 resident monkeys tend to be added to cakes, muffins, pancakes and smoothies. We are also tomato fans. Recently our strawberries and stone fruits seem to be going off a little early. I decided to stew them up. I could've used the thermomix, but I felt like cooking the old fashioned way, and Ingrid was hovering to help. Sometimes it is nice to handle the food and to actually cook it. 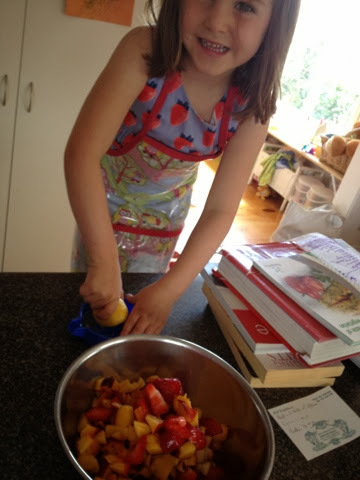 We stewed left over peaches, nectarines, strawberries, apricots and one very mushy pear with lemon juice water and sugar. Mr TBT (That Bettie Thing) declared the fruit stew the best he'd ever had. That's because I put too much sugar in. WAY too much sugar. 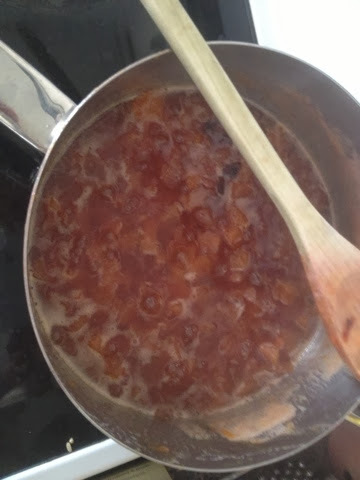 It could actually pass as jam. Oh well, mix it with Greek yoghurt and some nuts and I'm sure it will still have 1/4 the sugar content of Cheerios. Meanwhile, all that was left of the Christmas ham was the bone. Last year we wasted it, but this year we made soup. 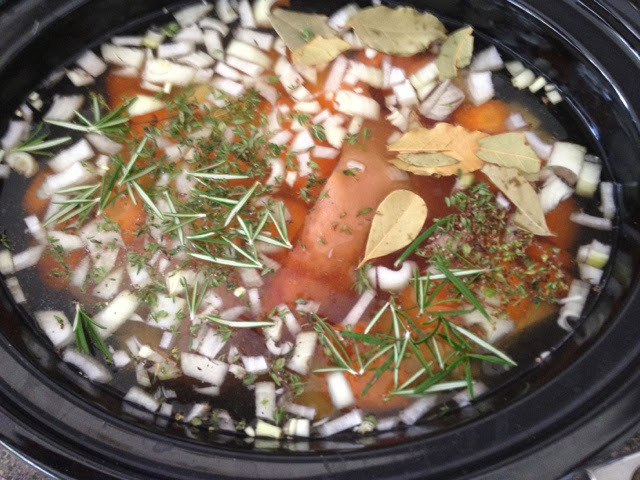 We popped it in the slow cooker with carrots, spuds, onion, garlic, thyme, rosemary and bay leaves and chicken stock. After a few hours we removed the bone and pulled what meat was left off and returned the meat to the soup. Unfortunately there was a lot of fat left floating on top. I tried the old granny trick of adding an ice cube. The fat sticks to the ice cube and if you remove it again promptly the fat goes with it. A few ice cubes later and it was a much nicer looking soup. We then added a tin of kidney beans and carrot. Mr TBT tried it un processed the tried Arthur's puréed serving and decided to process the lot. There you go. That was the very last Christmas left over! !